Aerial view of NAS Rockaway in 1919 looking eastward with view of airship hangar. Naval Air Station Rockaway adjoined Fort Tilden on the western portion of the Rockaway Peninsula in the New York City borough of Queens. It was established on transferred municipal property in 1917 during American involvement in World War I, and was demolished in 1930 to make way for Jacob Riis Park. Operations were moved across the inlet to a hangar in the municipal Floyd Bennett Field, which itself was sold to the federal government in 1941 and made Naval Air Station New York. NAS New York was decommissioned in 1972 and is now a part of the Gateway National Recreation Area, as are Fort Tilden and Jacob Riis Park. The station was the departure point for the first transatlantic flight in 1919, executed by the crew of the NC-4. On November 27, 1918, the NC-1 took off from the station with 51 people aboard, establishing a new world record for persons carried in flight. On August 31, 1921, an airship hangar caught fire. It destroyed the D-6 blimp along with two small dirigibles, the C-10 and the H-1 and the kite balloon A-P. 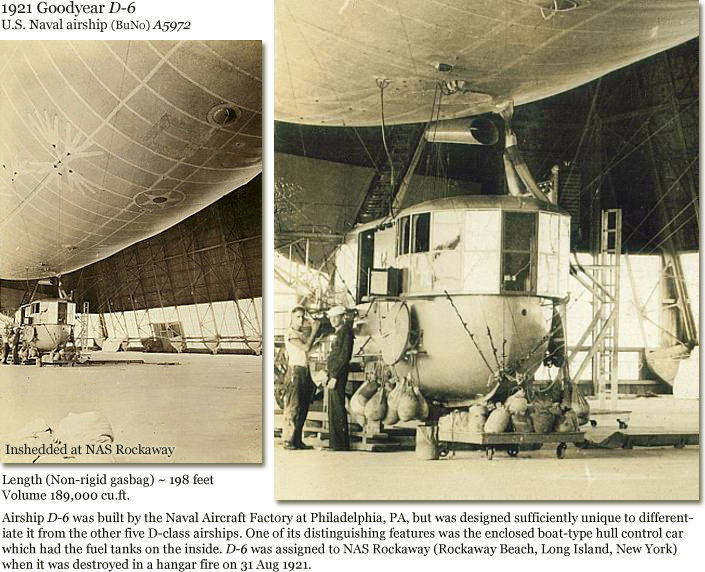 The D-6 was built by the Naval Aircraft Factory, Philadelphia, Pennsylvania, to a design somewhat different from the other five D-class airships. It featured an improved control car (the "D-1 Enclosed Cabin Car) which had a watertight bottom for landings on water, and internal fuel tanks. ^ "The First Flight Across the Atlantic", Naval Historical Center. Accessed July 11, 2007. "Soon the NC-l would establish a record by carrying 51 men aloft, including the first deliberate stowaway in aviation history." This page is based on the Wikipedia article Naval Air Station Rockaway; it is used under the Creative Commons Attribution-ShareAlike 3.0 Unported License (CC-BY-SA). You may redistribute it, verbatim or modified, providing that you comply with the terms of the CC-BY-SA.